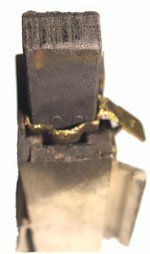 This page gives free diagnostic and advice for competent repairers who may want to confirm and check a few things before replacing carbon brushes in a washing machine motor. The principles of diagnosing carbon brush faults and deciding if they are worn, or faulty and need replacing are exactly the same as for any motor with any carbon brush across all brands. How do I know if I need to fit new carbon brushes? You should be competent enough to be able to diagnose and repair this type of fault because other faults could be present. You should always test a motor’s insulation with a suitable insulation test meter to ensure electrical safety using 500V DC. If carbon brushes are worn, the motor will either stop running or will run half-heartedly and make a crackling or grating noise. If you observe lots of sparking from inside the motor then this is also a symptom. Note that minute sparks are usually normal though, and that if a motor has stopped running, there could be other faults on the motor itself, or on other parts or connections in the washing machine. Faulty motors can also blow the control PCB. Here is a picture of a pair of worn Hotpoint carbon brushes. Both carbon brushes are approximately 80% worn but the carbon brush on the left is still making good contact with the armature. The difference between the two is that the faulty one on the right is charred and sooty at the tip. It’s taken on a charcoal-like appearance and there is evidence of burning present. The good carbon brush on the left is smooth and shiny at the tip which shows no sparking has been occurring. If both brushes are smooth like the one on the left, then they are still making good contact and are not likely to be causing any symptoms. However, if they are as worn down as this they clearly still need replacing. It’s just that maybe the fault you currently have is caused by something else. The tip of the brush (that runs against the armature) is shiny and smooth, with no evidence of burning and is therefore perfectly alright. It is possible for a carbon brush that is not worn down significantly to stick inside the holder (which is spring loaded) If this happens, then as the brush surface wears through normal usage, the brush doesn’t get moved up and stops making contact with the armature. If this happens, then the tip of the carbon brush will look charred like the 80% worn one above. This carbon brush is approximately 50% worn but something has gone seriously wrong. If yours looks like this then there could be problems with the other parts inside the motor. The tip of the carbon brush is charred but note the arcing damage to the brass holder which has been caused by excessive sparking and flashing inside the motor. If the tip of the carbon brush is damaged to the extent that there is a chunk broken off, (not shown here) then there is a good chance that a raised commutator bar on the armature has caused the fault. This would require a new armature (or sadly more likely these days a complete new motor). If the washing machine has also fused, then this is evidence of electrical shorting inside the motor which you need an insulation test meter and electrical knowledge to diagnose and repair. Also, if there is damage like this on the brass holder (and especially if the washing machine fused) then the TOC could have blown also. This is then not a simple case of replacing the worn carbon brushes and no longer a straight forward DIY repair job. Want to buy some carbon brushes? One of the symptoms of worn carbon brushes that may need replacing is flashing and sparking when running. However, it could also be a symptom of the main armature being worn too. Yes small sparking (blue coloured) is usually nothing to worry about. It’s “flashes” which are not good. Any motor sparking enough to cause flashes of light to reflect in the floor underneath it or that are going all around the armature or creating noise should be investigated. Its small sparking whiteblue in colour,it appearsduring spin,and it is noticible only extremely dark room.is it normal?asking regarding front loading washer.there is no smell at all. My hotpoint washing machine is not going through its cycle correctly. Sometimes doesn’t rinse & at others won’t spin. Can go back & do these individually on machine. Does this sound like the brushes need replacing? No it doesn’t Amanda unless when you say sometimes it doesn’t rinse or go through its cycle properly that you just mean the motor stops running. Carbon brushes can cause intermittent symptoms but they usually just mean the motor works sometimes and not others. The wash cycle would normally complete with just the drum not turning although these days most washers should report a motor error code. A few (like some Hotpoint and Indesit models) can go completely dead if the brushes stop making contact. The lights work but everything else is completely dead. Would worn carbon brushes be giving off a smell and slight noise, sort of rubbing? Kim: worn carbon brushes which are sparking heavily can give off a smell of burning. They also make a grating noise or slight crackling noise which is the noise of the sparks. My machine stops and starts and goes through cycle water coming in and draining but not much happening with drum rotating.Seems stuck on wash light- It it possible its the bushes or it more likely to be the module Only had it 15 mth but used every days… its indesit IWD 61450 model washing machine . Hello Chris. Apologies for such a late reply. You’ve probably got it sorted by now but please post back your experience for others to see. White and blue sparks coming from the motor sound fairly serious. Worn carbon brushes will cause sparking but they usually cause the motor to run slower than usual or erratically because it’s not getting full power. So if the water is coughing and spluttering at the same time it could just be one brushes. However, if it appears to be running at full speed unabated with lots of flashing and sparking this implies that the brushes are making reasonable contact but there may be something wrong with the armature which would usually require a replacement motor these days. A motor that has flashed so much that the washing machine stops spinning (presumably because the electronics have detected something wrong) would ideally need testing with a proper insulation test meter to make sure there is no leakage to earth which can happen when carbon dust builds up and the power tracks down to the casing. hello please help. I have a indesit washer dryer that is only 12 month old and as my partner tuned off the light in the utility room he noticed blue white sparks under the washing machine. Is it possible to be the brushes and can this cause an explosion? Hello Laura. This isn’t necessarily anything to worry about. I’ve seen it lots of times on shiny reflective tiles. It depends on how big the sparks are and if there is any noise with them like a crackling or grating sound. It’s not unusual for a motor to have minute sparks when turning but if they get larger, are making a noise or they actually flash and change in intensity I’d get them checked out. If they are very small and uniform in size just keep an eye on them to make sure they don;t get any worse which would indicate one or both of them may be sticking or worn out but at 12 months old that would be unusual. If the motor is definitely running but the drum isn’t going round the most likely explanation is the belt is broken or come off. Hi, I don’t think we have semi automatic washing machines here, it doesn’t sound like a UKfront loading machine which is what I deal with. On a front loading machine if the motor is running and the belt is on the drum must turn unless the belt is so loose it’s slipping. If there are some gears they could be an issue there.